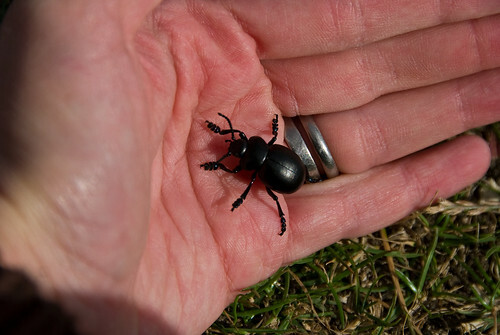 A lumbering, flightless leaf beetle, often seen plodding across paths or through grass. In this case, he was fighting against the stiff breeze on the top of a cliff on the Jurassic Coast at Lulworth Cove. When disturbed, these beetles exude a drop of bright red, blood-like fluid from their mouth. I must not have disturbed him, he didn’t spew any goo at me. This photo doesn’t capture the color very well, but the elytra had a metallic purple sheen too it. 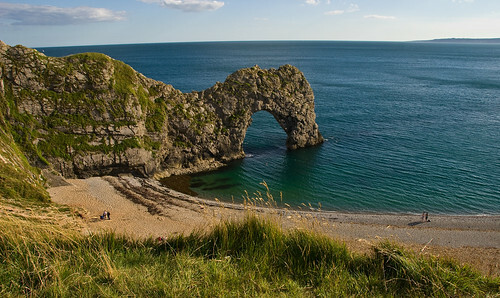 After Lulworth Cove, we drove to Durdle Door, a natural limestone arch on the Dorset coast. After Lulworth Cove, we drove to Durdle Door, a natural limestone arch on the Dorset coast. This coast line is riddled with interesting geology and features. If you can imagine a layer cake with three cake layers turned on it’s side: a layer of vanilla, a layer of chocolate and a layer of carrot cakes, you can imagine what this coast looks like geologically. The layers of rock have been uplifted and tilted, revealing interesting patterns in the strata, eroding differentially making these coves and arches. We sat on the pebbly beach and dipped our feet in the cold cold water. Mark was significantly braver than me and went for a swim. Just to say he swam through Durdle Door. Mark remarked on the fact that we knew we were going to the coast, to the beach, and at no point did we even consider bringing swimsuits or towels. I was bundled up in a sweater. It was a gorgeous sunny day, no doubt, but the stiff breeze was chilly. Posted by deb on Tuesday, July 22nd, 2008, at 9:55 pm, and filed under England Sites, Hiking, My life with bugs, Travel, Travel: England, Wildlife. There are some great cottages just outside of Abbotsbury that we stayed in for a “week away from the world” a couple of years ago. Some nice walks along the coast towards West Bexington too.